The bright colors are in now on the golf course. I’m not sure how it started, but the rule now seems to be: the louder, the better. Have you seen what John Daly has been wearing lately? I can’t roll with his style yet, but I do think guys like Ian Poulter and Luke Donald are looking pretty dapper. 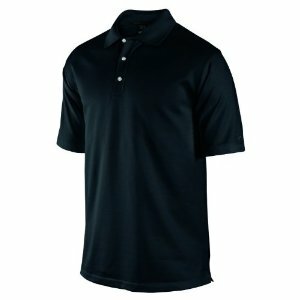 You can get this Men’s Tiger Woods Birdseye Golf Shirt in four different colors. If you are really brave, go with the pink! If you go with the black -- you are a chicken! I always tout the Nike Dri-fit apparel because of the feel. The shirt is so light and soft you barely feel like you are wearing anything. The material wicks perspiration away and breathes to keep you cool. They should make bed sheets out of this stuff!